You don't need to be a risk management guru to see why motorways are the safest roads in Britain. When all the traffic is travelling the same way, on the same carriageway, separated by a barrier from the opposite carriageway, the odds of a collision are far lower than on a typical two-lane, two-way road. And although the risk of a traffic accident fatality remains greater on roads with a higher speed limit, statistically you're still less likely to be involved in an accident on a motorway. In 2010, 71% of casualties occurred on built-up roads compared to 24% on non-built-up roads and 5% on motorways. But when things do go wrong on a motorway the results can be catastrophic, especially if an HGV smashes through the central barrier straight into the oncoming traffic. Thank -fully, it's a rare occurrence. However, the likelihood of an HGV breaching the central bulwark is greatly increased by the fact that the current metal or wire-rope barriers used on most of the UK's motorways and dual carriageways aren't designed to withstand the impact of a 44-tonner travelling at 85km/h. Their N2 specification only requires a capability to contain a car weighing up to 1,500kg, striking it at a 20° angle, travelling at a speed of up to 110km/h. certainly not a fully laden artic. The limitations of N2 barriers have not been lost on highway engineers and safety experts. Doubtless it was one of the reasons why in 2006 the Highways Agency (HA) confirmed that 'high containment' concrete central barriers would be installed on all new motorways and on those existing motorways where the metal barriers have reached the end of their useful life. Concrete barriers have a number of advantages. Their service-life is double the current 25-year span of steel barriers. More importantly, from a road safety perspective, their H2 specification is more stringent, as they must be capable of containing a vehicle weighing up to 13 tonnes. That improved performance, says the HA, "reduces the likelihood of a vehicle crossing the central reserve and reaching the opposite carriageway". Concrete barriers also need less remedial work (if any) after an impact, so maintenance teams are exposed to less danger while making repairs. Naturally, any reduction in repair time also cuts consequent traffic congestion and delays. 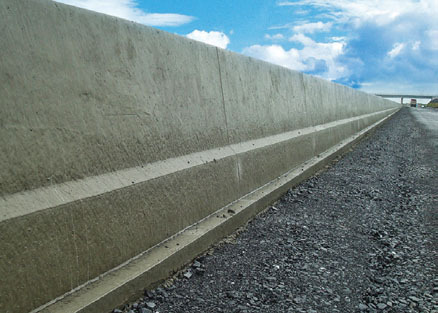 Two types of concrete barrier are used on English motor -ways and selected A-roads. The most prevalent, adopted by the HA in 2006, is the Dutch Step. The 900mm-high vertical barrier features a distinctive, stepped-base profile. The other type, found on the M25, consists of two flat-face concrete walls with an aggregate 'in-fill'. Five years on, the pace of replacing steel with concrete might surprise some. Of the 1,823 miles of motorways in England (the HA is not responsible for motorways in Scotland or Wales) only 11.7% - some 214 miles - currently have concrete barriers to the higher H2 standard. An additional 1.7% (31 miles) is made up of non-stepped DfT-designed concrete barriers on the M25. The remaining 86.6% (1,578 miles) is made up of metal barriers of differing types. 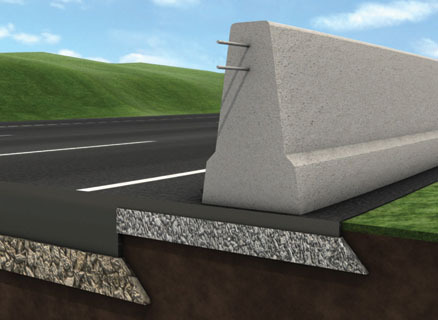 "Concrete barriers have been developed and tested to prevent that most dangerous motorway accident - the crossover"
In the UK the design rights to the Dutch Step barrier are held by Britpave, the transport infrastructure group and trade association. Its commercial arm acquired them from the Dutch government and licenses their use to approved installation companies carrying out replacement barrier projects. Britpave director David Jones says the original design has evolved, not least in the way it is surface-mounted to the carriageway. 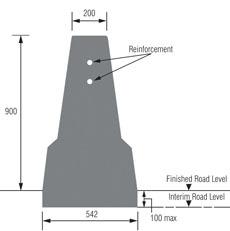 The revised barrier design has also been renamed the Britpave Concrete Step Barrier. 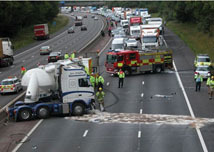 "Concrete barriers have been developed to prevent that most dangerous of motorway accident - the crossover," says Jones. "Recognising their safety benefits, the HA has begun a programme of replacing steel with concrete where motorway traffic exceeds 25,000 vehicles per day." While H2 barriers only need to stop vehicles up to 13 tonnes, they've proved resilient in withstanding an impact from heavier trucks. "Of the five major HGV hits on motorway concrete barriers we're aware of in the past five-and-a-half years, there've been no reported crossover accidents," says Jones. Yet he describes the current rate of replacement as disappointing, adding: "Despite their recognised benefits, they've only been installed on some 10% of the motorway. The replacement programme of obsolete steel barriers with robust concrete installation needs to be accelerated. I think it's important for CM readers because the [concrete] barriers have prevented crossovers, restraining well above their design. They've been holding 44-tonne trucks." While any changeover will inevitably be dictated by the rate at which the current steel stock ages, Jones wants the HA to broaden the scope of its replacement programme. "The other thing we'd like is that this current policy only applies to motorways - we'd like it extending to all trunk roads, many of which are carrying very high volumes of traffic." Jones is also concerned as to what effect any possible budget cuts might have on the HA's barrier strategy. 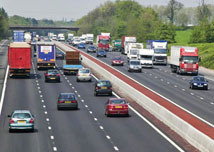 The replacement of metal N2 barriers with H2 Britpave Concrete Step Barriers on English motorways is a work in progress, which will last many years, especially as some of the current metal stock will have been either new, or nearly new, in 2006 when the HA made its decision on concrete replacements. It will be closer to 2030 before those metal barriers are approaching the end of their working life. The HA says: "There is no programme of replacement for motorway steel barriers, which have a service life of 20 years. Agency policy is that high-containment rigid concrete barriers replace metal barriers when they reach the end of their usable life and where motorways are being construct -ed. There will be specific areas where these concrete barriers aren't suitable and where alternative barriers and safety fences may be more appropriate." Highlighting recent work on the M4, an HA spokesman insists: "We issued a press notice recently [see box] explaining where we're putting in concrete barriers. We are replacing steel barriers, but it's where there's a need to replace them rather than taking out perfectly useful steel barriers and replacing them with a concrete one."